Say you are one of the best feature film actors of our generation. If you are going to make a guest-starring appearance on network television, you might as well do it on one of the funniest comedies of the past 10 years: Modern Family. Ty Burrell, who plays "cool dad" Phil Dunphy on the hilarious ABC sitcom (Wednesdays at 9/8c), has revealed that his good friend, Edward Norton, will be making a guest-starring appearance on the show later in the season. Ty told tv.com: "We filmed [the episode] two weeks ago. [Edward] plays this former bassist for Spandau Ballet, but he tours by himself to make money, and all he does is play the bassline and sing background vocals." OK, I am so there! In the meantime, Edward is getting ready for the New York City Marathon on Nov. 1, where he is racing to raise money for the Maasai Wilderness Conservation Trust. 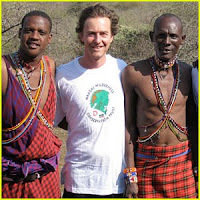 The actor has already raised more than $300,00 for the charity, which promotes sustainable development while protecting the east African grasslands that the Maasai tribe calls home.